One of the most requested tools I see talked about online is the cordless miter saw, and when Makita announced their first 36V lithium-ion tool I always expected them to come out with a 36V miter saw. Well I guess that for now I am still left waiting because Makita chose to go with 18V to power their new LXSL01 cordless miter saw. Though I can't say that I am disappointed with their decision, because their 18V line is super popular and already having 18V batteries will be a plus, if not a must. 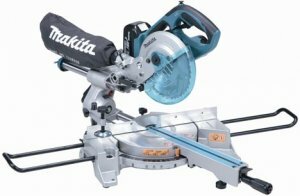 A cordless miter saw would be used for much smaller duties given the power restrictions that go along with being cordless, so it is fitting that Makita chose to make this saw only 7-1/2". The LXSL01 is small, but it is still a dual-bevel sliding compound miter saw, so it still has a pretty good cutting capacity. The LXSL01 is powered by a Makita-built motor that delivers 2,200 RPM's driven by a direct-drive gear box. Additionally the saw features an electric brake to maximize productivity as well as safety. The LXSL01 is a kit that includes the saw, 2 18V LXT Lithium-Ion batteries, 30 minute charger, 7-1/2" 40T saw blade, dust bag, socket wrench, triangular ruler, vertical vice, and 2 extension wings. The saw can be purchased as "Tool Only" as Model LXSL01Z. No word on pricing. 25-3/4" x 17" x 17-7/8"